It is the perforation of the uvula, a tiny, fleshy mass of tissue hanging from the soft palate at the back of the throat. 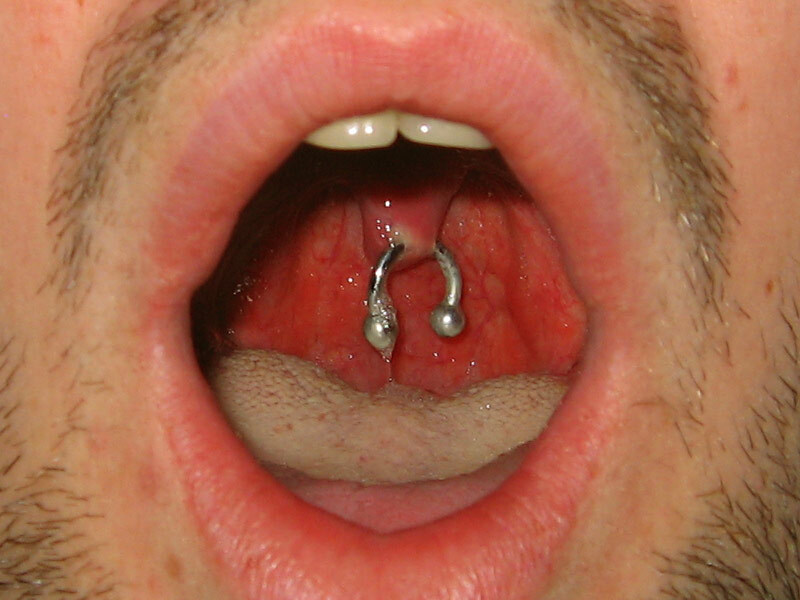 A rare type of oral piercing, getting a uvula piercing done could be a unique experience for the body piercing enthusiasts. 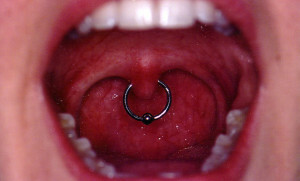 Double uvula piercing is a popular variation where two perforations are made on the uvula. As many piercing studios do not perform this piercing, you need make an extensive search to find a good salon that has expertise in oral piercings. It poses major challenges for the piercing professional as touching of the uvula causes the gag reflex, resulting in the contraction of the back of the throat. Prior to the procedure, you will have to rinse your mouth well using an antibacterial solution. After the clamping the uvula, a sterilized, hollow, pre-bent needle is passed through it. The jewelry is immediately inserted into the pierced mass of tissue to complete the process. It is considered to be one of the most painful piercing. Since uvula is a delicate tissue, getting it pierced hurts a lot. Like any other oral piercing, the pierced uvula undergoes swelling and bruising for few days accompanied by light bleeding. Complete healing of the piercing takes about 2 weeks. If the piercing is not carried out properly, then the uvula can become crushed leading to infection. Take medical help if the uvula undergoes abnormal swelling and reddening with occasional pus discharge. There is also a possibility of sleep-related breathing disorders due to the reduction of the diameter of the nasal passage. Loose placement of the jewelry would be highly risky as it might either get accidentally swallowed or inhaled, especially while sleeping. High chances of a jewelry rejection are also associated with this piercing. Go to the piercing studio to get it removed before any major health issue occurs. Captive bead rings of 14-gauge or 16-gauge made of titanium, stainless steel, and niobium are used for the piercing. Circular barbells could be worn once the pierced uvula heals completely. The price of the piercing is somewhere between $100 and $180 in a reputable parlor.